Rice Village has a great array of restaurants and shops! It has food and culture from many nations around the world. To my knowledge, every continent except Antarctica is represented. 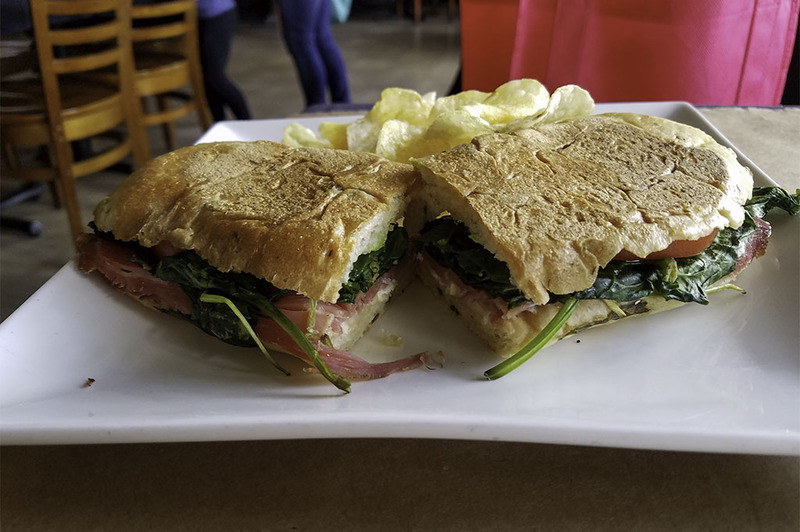 With the proximity to West University Place and the Medical Center, it is certain that a good bistrot serving excellent coffee, wine, pastries, and of course food would do well. Salento Bistrot is one of these places. Salento serves food and wine from a mixture of European and Latin American cultures. If you’re looking for an espresso Cubano or a pressed grilled sandwich, this is the place! They also have a good stock of wines from around the world, as well as local craft beers and in house prepared desserts. Whether you come for breakfast, lunch or dinner; this urban hub can provide you with an oasis filled with wonderful international music on the speakers, good food and wine on your table. On this particular day, I came for lunch and surveyed the menu. I found an interesting mix of sandwiches, salads, soups, and sides. If you want a fresh Caprese salad with mozzarella and arugula, they have your back. Maybe you want sandwiches made on a crusty baguette? Perhaps you prefer it cooked on a press grill and filled with things like brie, prosciutto, or chicken pesto? Ceviche tostadas with hummus filled cucumbers on the side? If so, you have found your place! And of course, a nice selection of wines by the glass, carafe or bottle. The atmosphere feels a bit like a European café in Spain, with the exception of being more indoors. I was very thankful that they had strong air conditioning for the Houston heat! Wines line a portion of the walls, along with a nice ceiling border showing a wide assortment of finished wine bottles. Any of my wine-loving readers would be happy with that! Overall, a very comfortable environment for a relaxing, slow paced late lunch. I tried two different lunch entrees: the brie and prosciutto sandwich, and the salmon tacos. The Brie and prosciutto sandwich has its two namesakes on olive baguette bread with avocado, tomatoes and lettuce. When I received the sandwich, my first thought was that it looked a little bit like a Cuban stogie roll sandwich. Clearly it had been cooked in a sandwich press grill. Prosciutto is an Italian dry-cured ham that has very robust flavor, especially when it is well marbled with fat and lean throughout. It is much bolder than the usual hams we have in the United States and makes for a great sandwich! When paired with Brie—a soft cow’s milk cheese named after the region of origin in France—there is a dance that the bold prosciutto makes with the mild, creamy cheese that is not an ordinary ham and cheese on a roll! The addition of the avocadoes gives more creaminess with an herbal essence that says Latin America. This sandwich is a true fusion of European, Latin and American flavors that satisfy! 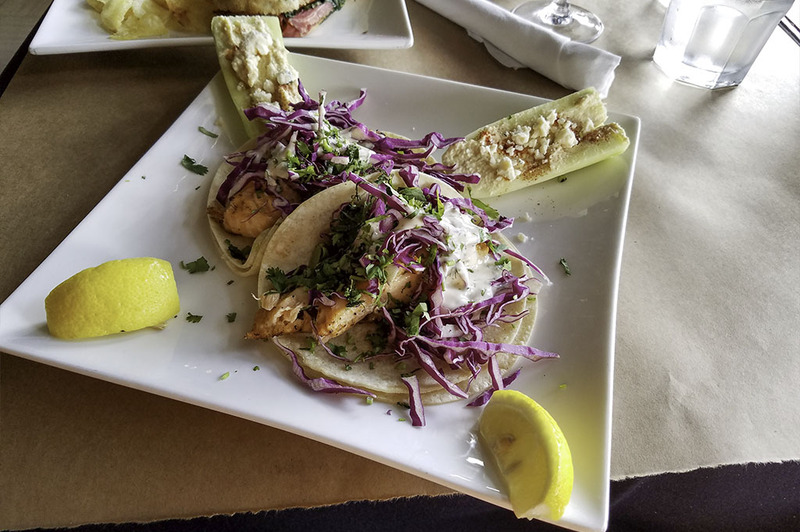 The salmon tacos are based on the San Diego/Baja California recipe where the fish is marinated in cilantro and lime, and served on white corn flour tortillas with red cabbage. But instead of the usual cilantro mayonnaise, a lemon dill aioli is used. Salmon has a bolder flavor than tilapia or grouper. When cooked properly, it has a better texture in the mouth. The citrus came through nicely, along with the herbal twang of the cilantro. The use of two white corn tortillas held the tacos together without the usual aluminum foil wrapper. This bolder take on the fish taco pleased me quite well! And for those of you who are fans of Pinot Noir or the movie Sideways, I found a Pinot Noir from a winery in France called Les Charmes that was $9.00 per glass. The wine was acidic and had plum and floral notes that went very well with the Brie and Prosciutto sandwich. I was very happy with the wine and am now searching for a bottle here in town. 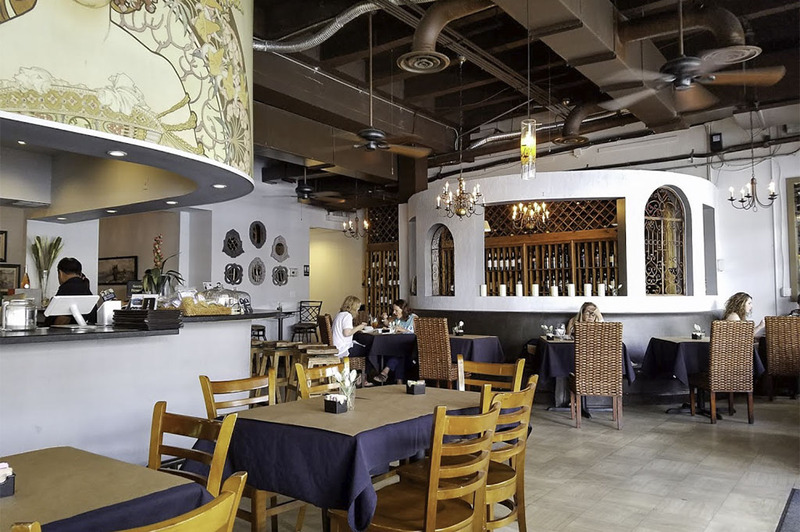 Salento also has a more extensive dinner menu which includes empanadas, chicken marsala, Filet Mignon bites, or cheese and charcouterie plates. There are also pizzettas—a Latin take on pizzas—a good selection of salads and desserts as well. I enjoyed my selections at Salento Bistrot quite well and I am confident you will too!